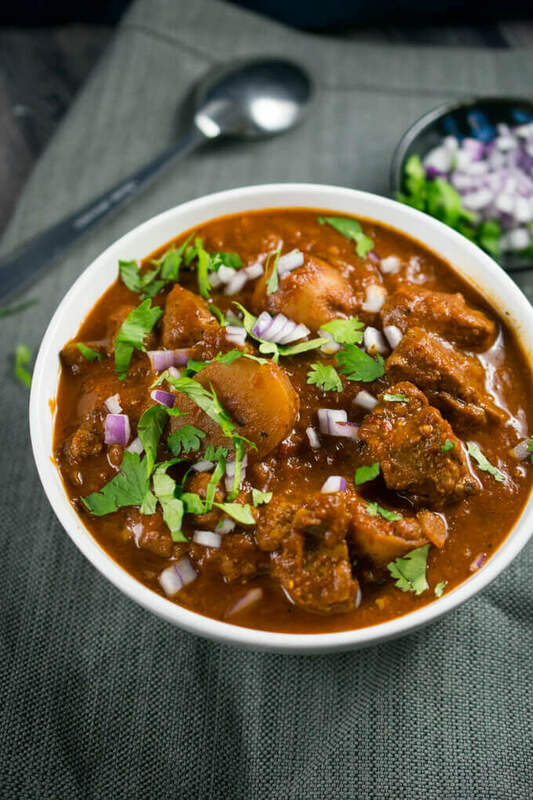 Chile Colorado is a Mexican-style red chile sauce that gets its burgundy hue not just from tomatoes, but from lightly roasted and pureed dried chile peppers. 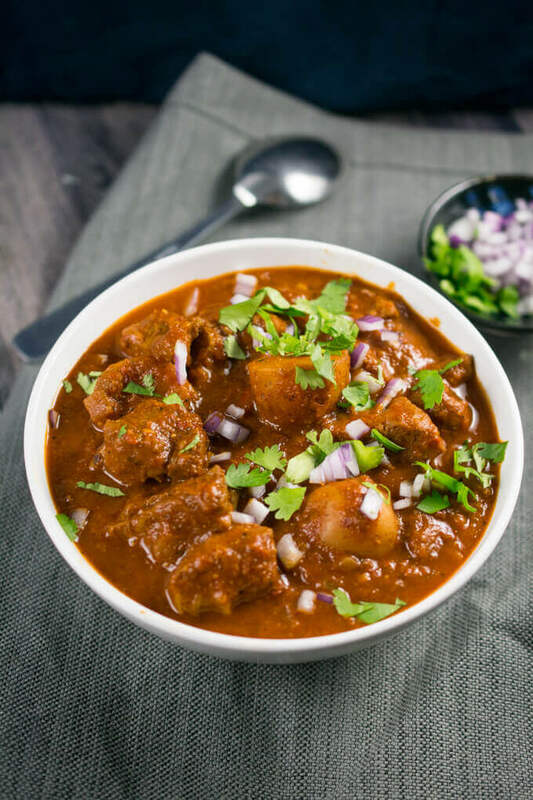 The result is a flavorful, peppery, tangy and just slightly spicy sauce that can be used for enchiladas or turned into a stew. 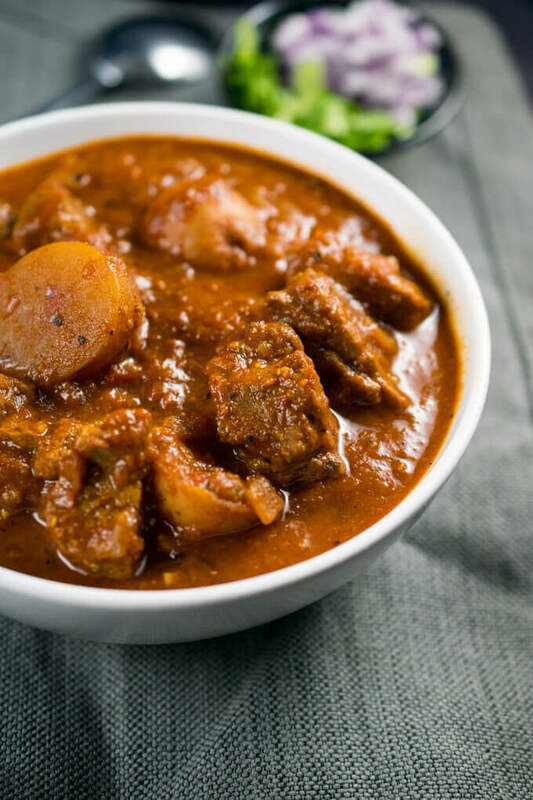 Traditionally such a stew might be made with braised pieces of pork or beef, and the chile colorado made with chicken stock. In this vegan version I’ve swapped in some waxy potatoes and seitan for a dish that’s just as hearty, minus the meat. I learned the hard way while testing this recipe that seitan just does not really benefit from being braised. 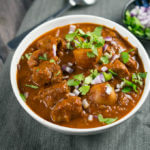 You see, after how much all of you loved my slow cooker tofu tikka masala, I was eager to make this a slow cooker dish. After 8 hours of patiently waiting, I discovered seitan that had turned strangely chewy and mealy. I picked it out :(. Now that I think about it… why would seitan need to be slow cooked? It’s already cooked to begin with and has little to no fat to caramelize. All that happens when you cook it for 8 hours is that it overcooks and gets more chewy than ever, instead of turning tender. Live and learn. Trial #2 involved slow cooking the vegan chile colorado sauce and potatoes, and then adding pan-crisped seitan toward the end along with the corn flour. But you know what? If a slow cooker recipe requires sauteing ingredients at the beginning, slow cooking them, and then another round of sauteing ingredients, adding them in, and cooking, maybe the slow cooker just isn’t adding anything to the equation :D. My final vegan chile colorado seitan stew is made fully on the stovetop and more sensible for it. Following a non-vegan recipe I found online, I used a mixture of dried Guajillo, New Mexico, and de Arbol chiles. I believe you could mix and match other non-smoked dried chile peppers (aka avoid chipotles), just note that they have different levels of heat. The chiles de Arbol are doing the heavy lifting here with spiciness, with the others there for flavor. All of these dried chiles are available in the Goya section of my usual supermarket, for just a couple of dollars for a pack of each. 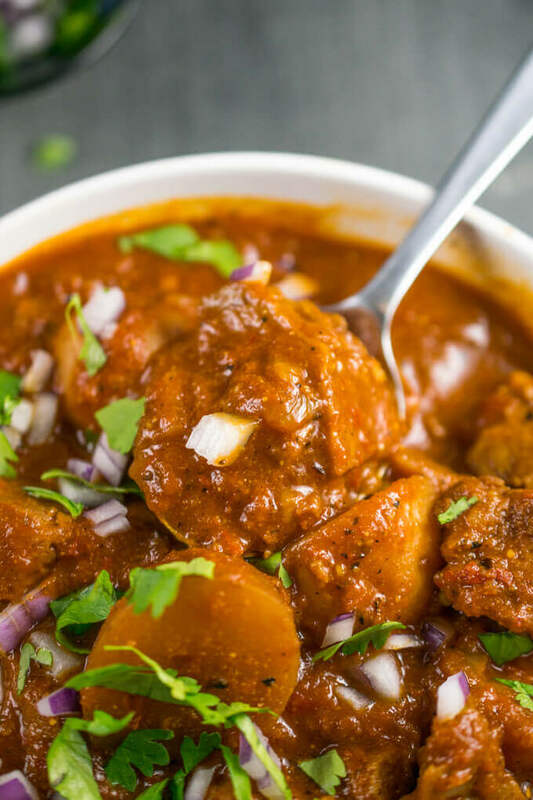 This vegan chile Colorado seitan stew is a plant-based, vegetarian spin on the better known meat version. Protein packed, smoky and delicious! Remove the stems and seeds from all of the dried chiles, and chop any larger ones into pieces. Next, lightly toast the chiles in a dry skillet over medium heat, until warm and slightly pliable, with small brown spots, stirring frequently, about 2-4 minutes. Add the chiles to a microwave-safe bowl with 2 cups of the vegetable broth. Cover the bowl and microwave for 2 minutes. Add to a blender along with the fire-roasted tomatoes, and blend until smooth. Set aside. Warm 1 tablespoon of the vegetable oil in a saucepan. Add the onion with a pinch of salt. Saute the onion, stirring occasionally, until translucent and softened, about 3-4 minutes. Add the garlic and stir, cooking for another 60 seconds or until fragrant. Finally, add the cumin and oregano, and cook, stirring constantly, for about 45 seconds or until just fragrant. Add the blended chile paste, the potatoes, and the remaining vegetable broth to the pan. Bring the mixture to a boil and then reduce to a steady simmer. Continue cooking covered, stirring occasionally, for about 20 minutes or until hot throughout, with the flavors melded. Meanwhile, warm the other tablespoon of vegetable oil in a skillet over medium-high heat. Add the seitan and cook, stirring frequently, for about 4-5 minutes or until slightly browned and crisped around the edges. Set aside until ready to use. Measure out approximately 1/4 cup of the cooking liquid into a bowl. Stir it together with the masa harina or cornmeal until smooth. Add this mixture back into the simmering pot, along with the apple cider vinegar, soy sauce if using, and pan-crisped seitan, and cook for about 5-7 minutes more, or until hot throughout and thickened slightly. Season to taste with additional salt and pepper, and serve hot. MASA HARINA: If you can't find masa harina or don't want to buy a whole bag, cornmeal also works. If you also don't want to use cornmeal, you can make a roux with all-purpose flour at the beginning of cooking, and add that instead. Adapted from Lemon Blossoms (non-vegan recipe). Looks good. If I cant find the chilies can I subsitute them for a spice of just green chiles? I can’t say for sure. The dried red chiles are pretty central to the classic flavor of this dish. If using fresh green chiles you may get a result that’s tasty but doesn’t look or taste like this one. Thanks for this recipe it was amazing! I have not tried seitan before and have been looking into which brand to buy or which recipe to use…I’m in California and I’m finding there’s quite a few options out there with a lot of mixed reviews. Can I ask your preferred brand or recipe and which you used for this? Yes, I use my own homemade seitan, linked in the ingredients list in the recipe! I’ve always enjoyed homemade way more than store-bought, but I prefer Westsoy as far as store-bought options go. Upton’s Naturals is a little too chewy for my preference. Pacific Foods is also good. This had a really good flavor. I used chickpeas instead of seitan because I don’t prefer seitan. Really enjoyed it. This looks so good!!!! Definitely going to try this! Does it freeze well??? I haven’t tried freezing this but I think it would!